We are on the eighth floor terrace of a relatively new apartment building in the Vedzisi neighborhood, nodding our heads with joker grins like gawkers at a freak show. The view is as spectacular as they come in mountainy Tbilisi, but that’s not what we’re chuckling at. There are 43 ceramic urns – kvevri – buried almost a meter and a half into a bed of sand and perlite in what was supposed to be a swimming pool for a nine-year-old boy. But in an epiphanic moment, the child’s father, 43-year-old doctor, Zura Natroshvili, decided to build a marani in the sky instead. The father of modern advertising, David Ogilvy, once said, “The best ideas come as jokes.” Dr. Natroshvili would probably agree. 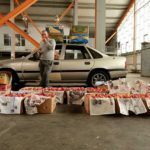 His friends thought he needed psychiatric help when he first shared his idea, and indeed there is something utterly insane about winching seven tons of Kakhetian grapes up eight floors to make wine, yet to the good doctor, it made perfect sense. He lives here, after all. 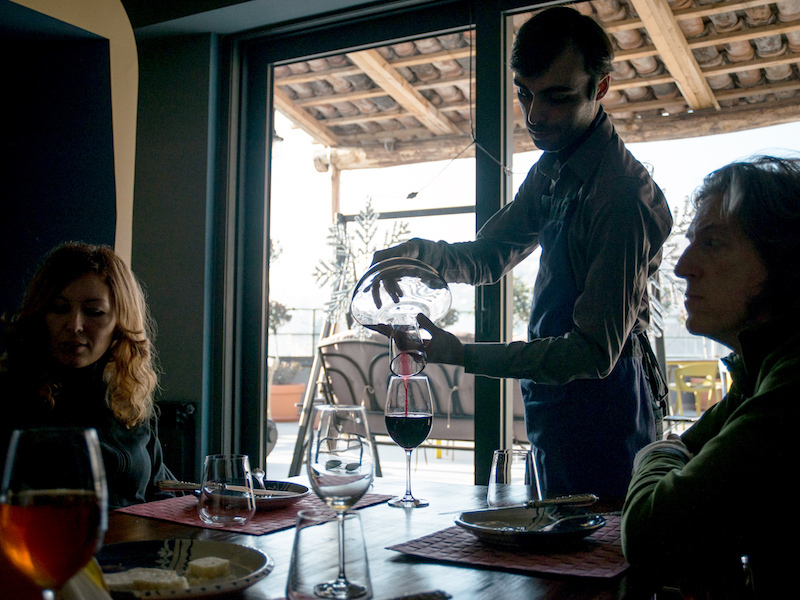 The original plan was to make natural wine in the village of Saguramo, about a half-hour drive north of the city. 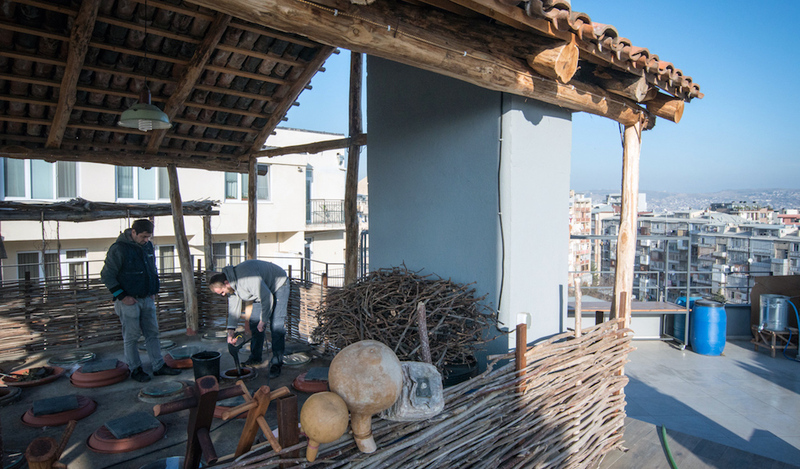 But while that idea was being fleshed out, Natroshvili bought 15 plastic barrels in 2015 and filled them up with four tons of grapes on the terrace of the block apartment he had recently bought. 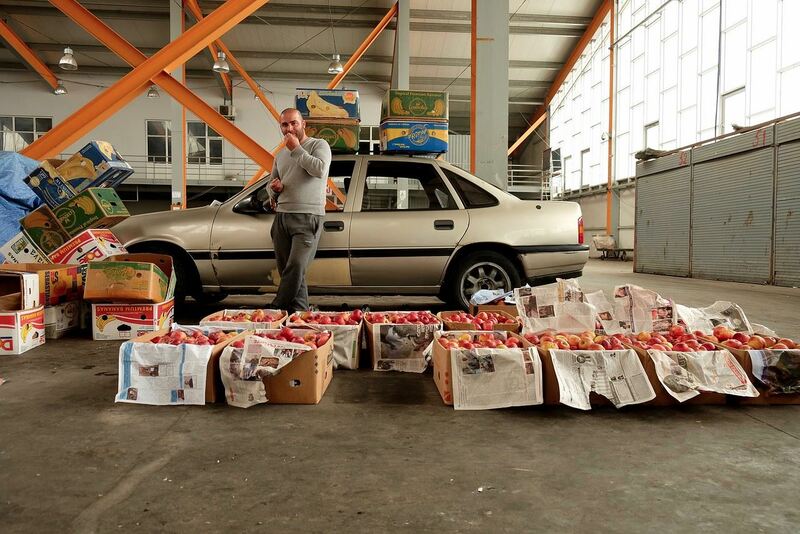 The results weren’t so bad for plastic barrel wine, so he bottled it and with a novice’s enthusiasm shared his wine at Tbilisi’s Young Wine Festival in 2016. 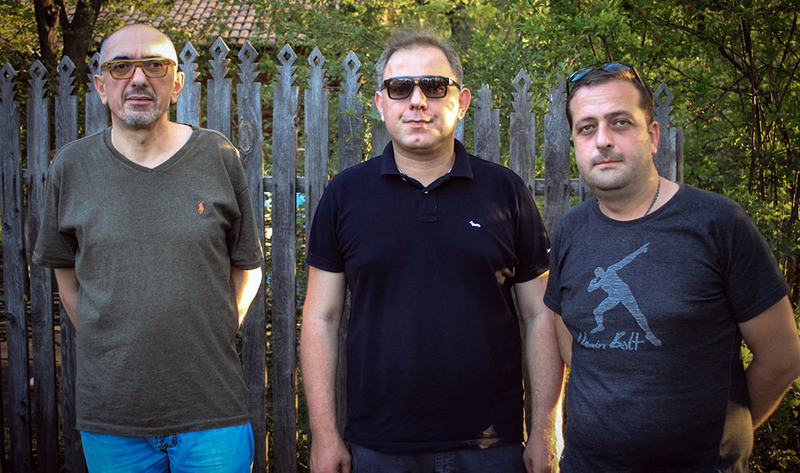 “Kakhetian winemakers at the festival looked at me as if I were weird. ‘Bina (apartment) 37? What is that?’ they said. ‘Where is your marani (wine cellar)?’” Natroshvili recounts. Feedback was positive, stoking the winemaking fever that had been creeping under the doctor’s skin. He couldn’t wait for the Saguramo project so he double-checked with the contractors to make sure the structure could handle 13 tons of fermenting grapes and got the green light. Kvevri are effective vessels for fermenting and storing wine because they are buried in the ground, which controls the temperature. Natroshvili consulted experts about ways to control the temperature in his above-ground marani, but they just shrugged their shoulders. Nothing like this had ever been done. “I am a doctor, not a winemaker,” Natroshvili admits. “I am a wine lover who makes wine,” he adds. After a rigorous selection process he found the right chef who could whip up authentic home-style cooking with the astuteness to adjust to the seasons and the integrity to maintain a high standard of quality and consistency. Like good wine begins in the vineyard, good food, Natroshvili says, begins in the orchards and farms. Only the freshest ingredients are used in the recipes. “We have three values: in vino veritas; people who love to eat are always the best people, to quote Julia Child; and guests are gifts from God,” Natroshvili explains. On a recent visit we went with a simple fried sea bream, a fish not often found on local menus as trout is the favored catch in Georgia. It was light and flaky and cooked to perfection and paired well with Bina 37’s tsitska wine, a crispy white with nutty undertones. We also couldn’t resist dipping into the Megrelian dishes the winter menu offers. The kharcho was mildly spicy with tender veal and a thick, rich walnut stew. The kuchmachi seemed like it came straight out of aunt Nino’s kitchen. No frills, not even the obligatory pomegranate seed garnish; simply a deep, hearty consort of pork innards and earthy spices. It would have been a mortal sin not to order elargi to accompany these, as nothing goes better with vivacious west Georgian meat dishes than the gooey virtue of cheesy grits. Naturally, we had the saperavi with this, which will be exciting in a year or so, after it matures more. We were surprised to see khinkali on the menu as it is not a wine-friendly dish, but then there is a chacha still on the terrace, which makes perfect sense. 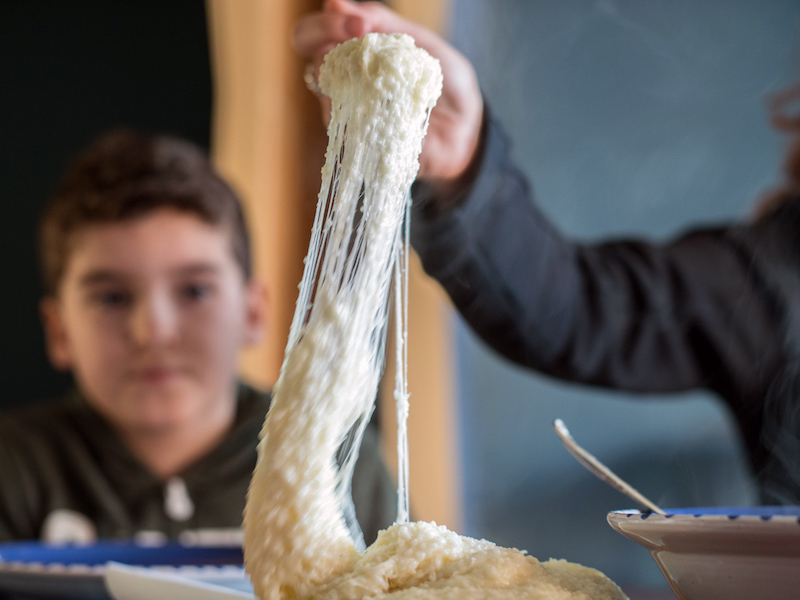 The dough for the plump dumplings is made by hand in true mountain style. Bina 37 is not a budget restaurant. It is quirky for sure – bonkers, even – but still, it’s not the novelty you are paying for. Okay, there are three booths in what was designed to be a living room. One private balcony has a table for six. When the weather warms up, the terrace provides one of the best dining locations in the city. You are somewhere between a private guest and customer. 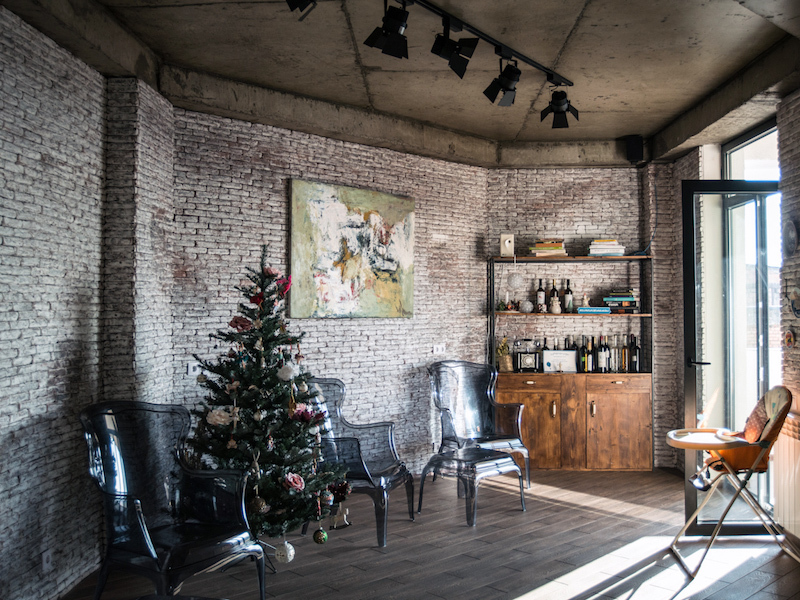 Some might find being in that frontier discomforting, but in a city full of traditional Georgian fare, it is honest originality that conquers. We asked Dr. Natroshvili if his son wasn’t a bit put off losing his swimming pool to a marani full of wine. He explained that his son cracked open his piggy bank, full of his life’s savings, and chose on his own to invest in a kvevri and fill it with saperavi grapes. His investment paid off and the nine-year old has become a full-fledged winemaker, even though he is not allowed to drink it yet.